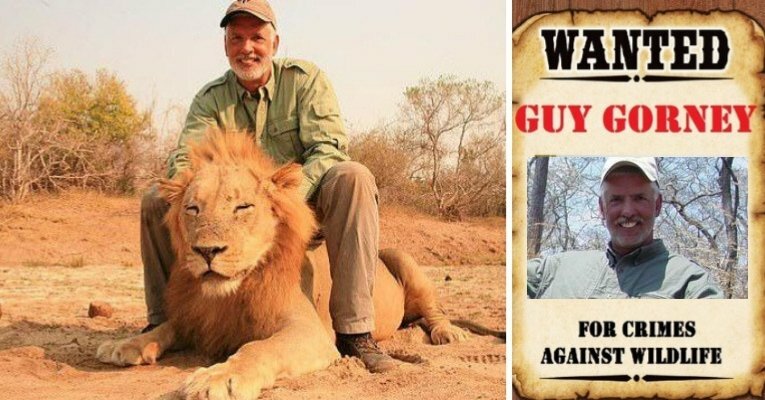 A clip of a trophy hunter killing a sleeping lion that was recorded in Zimbabwe in 2011 resurfaced this week after the Twitter account @Protect_Wldlife shared the video to their profile of over 335 thousand followers. The video shows 64-year-old Guy Gorney of Manhattan, Illinois aim and fire on a sleeping lion. In the video, the animal appears to be in pain as it gets up to look around and gauge where the attack came from, but before the animal could do anything, Gorney fired a second and third shot. Gorney is a known trophy hunter who has found himself at odds with activists in the past. During a 2015 interview, Gorney said that he had no remorse for killing 70 “trophy” animals such as elephant, lion, leopard, rhino, and buffalo. “I have a hard time understanding, if you have a picture of somebody with a deer, nobody seems to care. But if it’s an elephant, it’s a big problem. If it’s a lion – especially now – it’s a huge problem. But to me, either way, I’ve stopped a beating heart,” Gorney said. Obviously, there is a huge difference between a deer and a rhino or elephant–deer are not endangered nor are they facing possible extinction. According to the African Wildlife Foundation, lions may very well go extinct by the year 2050 if the current rate of hunting and poaching continues. In the past, Gorney has defended his actions by suggesting that he is simply doing his part in the food chain and that hunting predators actually protects weaker animals. “You can say, ‘Why’d you shoot a lion?’ I love zebra, so shooting a lion probably saves 70 zebra a year, give or take. There’s all these kinds of balances in nature,” he said. Gorney says that he likes the challenge of hunting large animals. “The ‘why’ is just the—I call it the adventure of it. Same reason Teddy Roosevelt did it,” Gorney says. After the post received more attention, the Twitter account that initially shared the video posted additional photos of Gorney and his previous trophy kills.